Published Jul 5, 2018 By Julia 6 CommentsThis post may contain affiliate links. 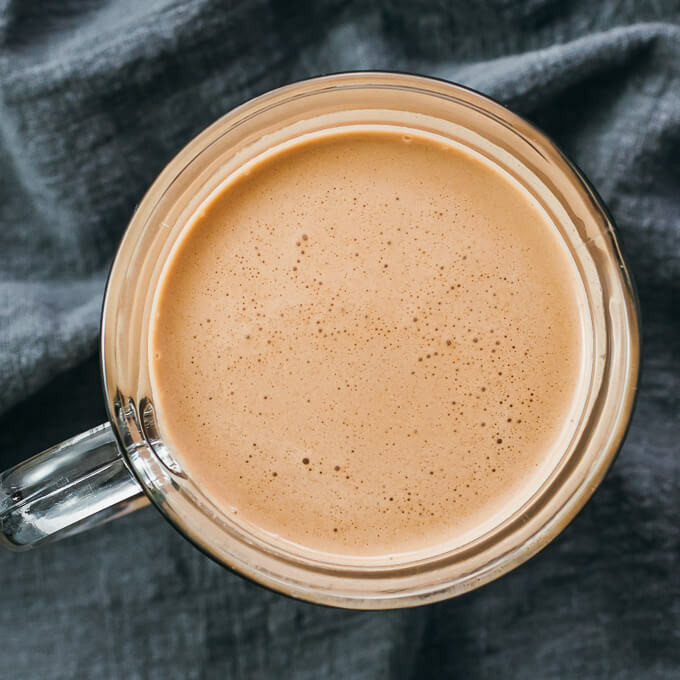 Calling all chocolate and peanut butter lovers — this keto shake is an easy drink that you can enjoy any time of the day, whether it’s breakfast, dessert, or post-workout. Low carb and gluten free recipe. Every time I drink this, I feel like I’m drinking chocolate milk, flavored with peanut butter. Which is excellent, of course. Being on a keto diet, it’s been awhile since I’ve had a glass of real chocolate milk. The texture is smooth and creamy, with a rich chocolate flavor. It’s not too sweet at all — more like a dark chocolate shake. This recipe is actually brought to you by Mr. Savory Tooth! We’ve been drinking Atkins Dark Chocolate Royale Shakes, which are protein-rich shakes with only 2g net carbs per serving. 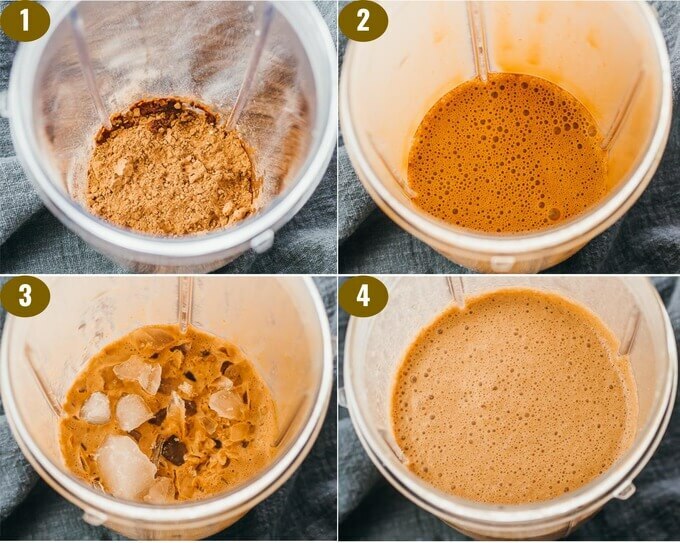 This keto shake is a homemade recreation of the Atkins version, plus peanut butter. You might be wondering why a drink recipe uses cream cheese and boiling water. 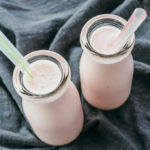 The cream cheese imparts a thick and creamy taste to the overall drink (similar to its role in Keto Milkshake Smoothie With Raspberries); without it, this keto shake falls flat and tastes watery. The boiling water allows the cream cheese and peanut butter to seamlessly melt and blend with the other ingredients. Otherwise, you’d be hard pressed to get cold cream cheese and peanut butter to mix well with other ingredients, even with a powerful blender. The salt is also essential. 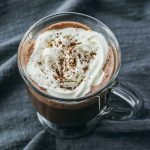 It enhances all of the flavors in the drink, especially the chocolate. There are two different methods listed in the recipe. The first uses a blender, which I recommend for ease of use. I use a Nutribullet, which is a personal blender, not a full-sized one. It’s great for smaller liquid amounts. The other method is for people who don’t want to use a blender. Instead, you can shake the mixture until it’s smooth. This also produces good results, but just requires a bit more effort to vigorously shake the mixture. Omit the peanut butter for a rich and creamy pure chocolate shake. Delicious, with more pronounced chocolate flavors. 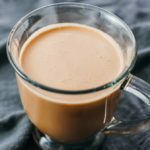 Add instant coffee (recommended is Starbucks Via) instead of peanut butter, or use espresso shots or strong brewed coffee instead of boiling water. Mocha shake! Let me know in the comments if you come up with any other flavors. You can also use pure erythritol, but it’s only about 70% as sweet as sugar, so you’ll need to use more than what the recipe specifies. Start with 1 1/2 ounces and go from there. Calling all chocolate and peanut butter lovers -- this keto shake is an easy drink that you can enjoy any time or meal of the day, whether it's breakfast, dessert, or post-workout. Low carb and gluten free recipe. In a blender, add swerve, cocoa powder, vanilla, and salt. Add boiling water, then cream cheese and peanut butter. Blend until the cream cheese and peanut butter are fully dissolved. Add crushed ice and blend until the ice is melted. Stir in almond milk. Serve immediately or chill in the refrigerator. Prepare a 20 ounce cup or other container that comes with a tightly fitted lid. In the cup, add swerve, cocoa powder, vanilla, and salt. Add boiling water, then cream cheese and peanut butter. Cover with a lid and vigorously shake for a minute until cream cheese and peanut butter are fully dissolved. Add 2 ounces crushed ice and 2 ounces cold water (instead of 4 ounces crushed ice). Vigorously shake until the ice is melted. 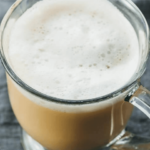 This recipe yields 3 g net carbs per serving (8-9 ounce drink). 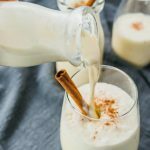 Can you use silk unsweetened coconut milk instead of almond milk, and stevia (powdered) instead of swerve? I haven’t tested this recipe with coconut milk, so I’m not sure if it would adversely affect the taste. Substituting with stevia is fine as long as you add to taste or convert so it’s the same sweetness. Could you use chocolate protein powder instead of plain cocoa? That might work but I haven’t tried it before. If you give it a shot, let me know how it goes! There’s a pin button at the top of the post, below the date/author line and above the body text.